Financial inclusion is on the rise globally, accelerated by mobile phones and the internet, but gains have been uneven across countries. 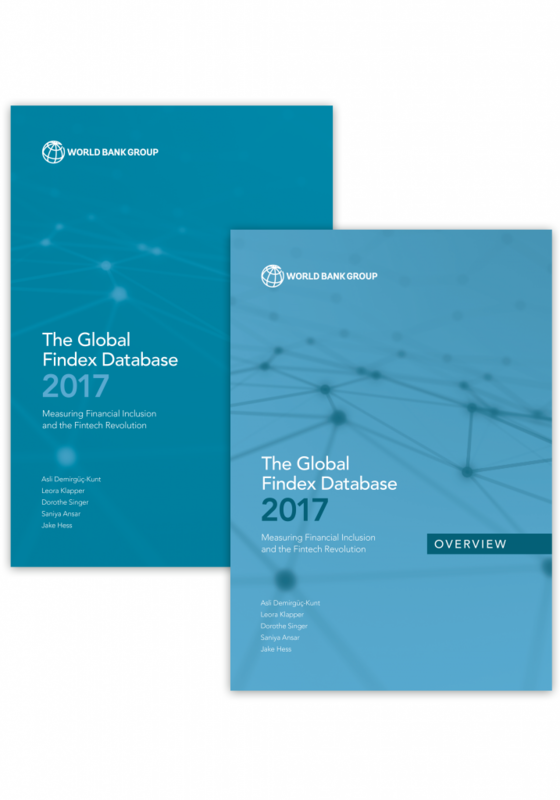 A new World Bank report on the use of financial services – Global Findex Database 2017 – also finds that men remain more likely than women to have an account. Globally, 69% of adults – 3.8 billion people – now have an account at a bank or mobile money provider, a crucial step in escaping poverty. This is up from 62% in 2014 and just 51% in 2011. From 2014 to 2017, 515 million adults obtained an account, and 1.2 billion have done so since 2011, according to the Global Findex database. While in some economies account ownership has surged, progress has been slower elsewhere, often held back by large disparities between men and women and between the rich and poor. The gap between men and women in developing economies remains unchanged since 2011, at 9% points. There has been a significant increase in the use of mobile phones and the internet to conduct financial transactions. Between 2014 and 2017, this has contributed to a rise in the share of account owners sending or receiving payments digitally from 67% to 76% globally, and in the developing world from 57% to 70%. Globally, 1.7 billion adults remain unbanked, yet two-thirds of them own a mobile phone that could help them access financial services. Digital technology could take advantage of existing cash transactions to bring people into the financial system, the report finds. For example, paying government wages, pensions, and social benefits directly into accounts could bring formal financial services to up to 100 million more adults globally, including 95 million in developing economies. There are other opportunities to increase account ownership and use through digital payments: more than 200 million unbanked adults who work in the private sector are paid in cash only, as are more than 200 million who receive agricultural payments. In Sub-Saharan Africa, mobile money drove financial inclusion. While the share of adults with a financial institution account remained flat, the share with a mobile money account almost doubled, to 21%. Since 2014, mobile money accounts have spread from East Africa to West Africa and beyond. The region is home to all eight economies where 20% or more of adults use only a mobile money account: Burkina Faso, Côte d’Ivoire, Gabon, Kenya, Senegal, Tanzania, Uganda, and Zimbabwe. Opportunities abound to increase account ownership: up to 95 million unbanked adults in the region receive cash payments for agricultural products, and roughly 65 million save using semiformal methods. In East Asia and the Pacific, the use of digital financial transactions grew even as account ownership stagnated. Today, 71% of adults have an account, little changed from 2014. An exception is Indonesia, where the share with an account rose by 13 percentage points to 49%. Gender inequality is low: men and women are equally likely to have an account in Cambodia, Indonesia, Myanmar, and Vietnam. Digital financial transactions have accelerated especially in China, where the share of account owners using the internet to pay bills or buy things more than doubled, to 57%. Digital technology could be leveraged to further increase account use: 405 million account owners in the region pay utility bills in cash, though 95% of them have a mobile phone. In Europe and Central Asia, account ownership rose from 58% of adults in 2014 to 65% in 2017. Digital government payments of wages, pensions, and social benefits helped drive that increase. Among those with an account, 17% opened their first one to receive government payments. The share of adults making or receiving digital payments jumped by 14 percentage points to 60%. Digitising all public pension payments could reduce the number of unbanked adults by up to 20 million. In Latin America and the Caribbean, wide access to digital technology could enable rapid growth in financial technology use: 55% of adults own a mobile phone and have access to the internet, 15 percentage points more than the developing world average. Since 2014, the share of adults making or receiving digital payments has risen by about 8 percentage points or more in such economies as Bolivia, Brazil, Colombia, Haiti, and Peru. About 20% adults with an account use mobile or the internet to make a transaction through an account in Argentina, Brazil, and Costa Rica. By digitizing cash wage payments, businesses could expand account ownership to up to 30 million unbanked adults, almost 90% of whom have a mobile phone. In the Middle East and North Africa, opportunities to increase financial inclusion are particularly strong among women. Today 52% of men but only 35% of women have an account, the largest gender gap of any region. Relatively high mobile phone ownership offers an avenue for expanding financial inclusion: among the unbanked, 86% of men and 75% of women have a mobile phone. Up to 20 million unbanked adults in the region send or receive domestic remittances using cash or an over-the-counter service, including 7 million in the Arab Republic of Egypt. In South Asia, the share of adults with an account rose by 23 percentage points, to 70%. Progress was driven by India, where a government policy to increase financial inclusion through biometric identification pushed the share with an account up to 80%, with big gains among women and poorer adults. Excluding India, regional account ownership still rose by 12 percentage points, but men often benefited more than women. In Bangladesh, the share with an account rose by 10 percentage points among women while nearly doubling among men. Region-wide, digitising payments for agricultural products could reduce the number of unbanked adults by roughly 40 million. Click here to view and download The Global Findex Database 2017: Measuring Financial Inclusion and the Fintech Revolution.